What Do I Need To Do To Meet EPA Requirements? What Are the On-Going Requirements for Leak Detectors? MACT stands for maximum achievable control technology. 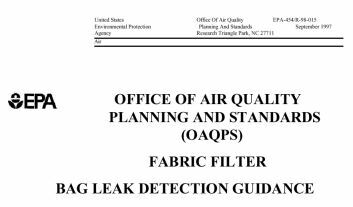 If your industry has been identified by EPA as a major source of metals or other particulate emissions and you operate a baghouse for particulate control, you will likely have a MACT requirement to install a fabric filter leak detection system. Although the language differs slightly from industry to industry, the effect is the same. 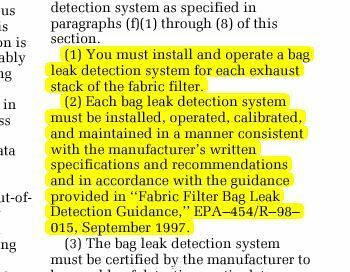 EPA requires that you follow certain procedures to ensure that data from the leak detection system is reliable (see the sample language below). Baghouse leak detectors are installed as indicators of fabric filter performance. The results from the leak detectors are NOT meant to be correlated with particulate emission test results. The results from the sensor are recorded during a representative period of well-controlled emissions and alarm level is set based on those results. The guidance document provides procedures for the initial and periodic setup of the alarm point. It also contains required on-going quality assurance procedures to make sure that the monitoring system is functioning properly (see below). For some probe systems, these procedures require significant labor by a technician as well as specialized equipment to generate the required signals that are representative of the process (e.g., pico amps). The G6-Plus sensor conducts these electronic checks automatically and the results are stored in modbus registers for display or logging. In the event that a calibration check fails, an alarm is generated. This requires you to periodically remove the probe and clean it, although it can be difficult to determine how often this cleaning must occur. Excessive dust build-up can either cause alarm conditions to be suppressed or it can also cause false alarms. MACT standards also require/allow you to set the alarm point of the leak detection system at least once per year. The alarm point is based on the typical response of the detector during normal operation of the baghouse. The alarm point also needs to be adjusted whenever the characteristics of the particulate change. If the size, composition, or charge of the particulate changes; the response of the leak detector will change as well. B3 Systems can conduct the initial installation and setup of the leak detector system (see Service Plan). We also offer a yearly service contract that includes the yearly setup. Because of the digital communication properties of the PCME network, setup and diagnostics can be conducted remotely using a modem or Ethernet connection. Our team of MACT compliance experts are ready to answer your questions about how to implement the regulations at your facility. We can also help with finding the right sensor for your particular application.